Aqueon Shrimp Essentials replaces important trace minerals that are vital to invertebrates and are removed through chemical filtration as well as used by individual shrimp in the aquarium. Shrimp and freshwater crayfish have exoskeletons that require additional nutrients for biological processes like molting and osmoregulation. These nutrients help the crustaceans cast off their old exoskeleton and harden the new one. 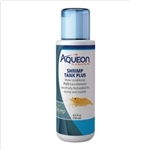 Aqueon Shrimp Tank Plus is specifically formulated for smaller aquariums with freshwater shrimp, such as Genus Caridina and Neocaridina, and other crustaceans. Instantly conditions tap water making it safe by neutralizing harmful chlorine, chloramines, ammonia and heavy metals. This formula contains additional beneficial trace elements for proper health and color expression in freshwater shrimp and crayfish. Use when preparing tap water for new aquariums, performing water changes or when adding water due to evaporation.